This was the scene that I observed in front of our house one wintry dawn last year. 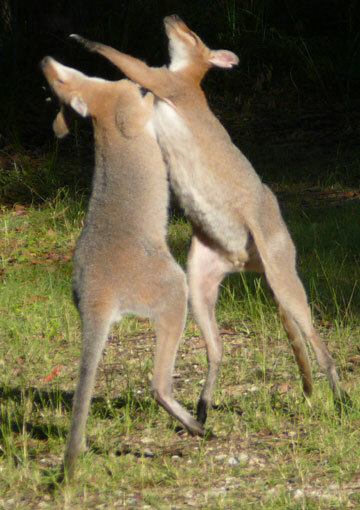 The combatants are young male wallabies. These lads had a score to settle over territory and females. How incredible to be able to observe such situations. This year the males have not yet appeared; in fact our wallaby population seems much depleted. The females and joeys seem to reside here fairly permanently. They now know us and allow us to get fairly close. Over the years I have noticed that the males seem to visit for a short time to joust and court then head off to seek greener pastures and new adventures. We have also been able to observe the joeys as their heads pop up for a first look at the world. Tiny and pink and curious. Blessed to have watched their excitement as they emerge from their mother’s pouch and test their legs. As they build confidence they almost fly as they race around the yard ecstatic with their new found freedom and speed. As they race around you can almost hear a “”wheeeeeeeee””. 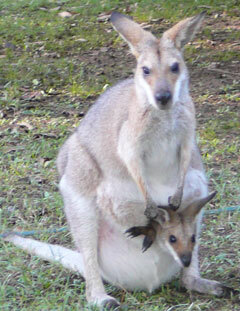 Some joeys are quite cheeky,even naughty, and pester their mothers, jumping on her back, hitting, pushing and even sparring; standing up and kicking like the males above. Sometimes two females will also have a spat and do the warrior dance too. Lately a noticeable absence from our garden has been koalas. To see one perched in a tree close to the house was always a thrill. Each time as exciting as the first. Their visits have decreased significantly although this property has a good many of the species of food trees for koalas. It is sad to realise that the next generations will not have the joy of being able to observe our national icons in their natural habitat. Sadder still that growth and greed are regarded to be more important than sustainanbility and preservation.